Yay Yay Yay! Happy happy day, Happy Veganniversary to meeeeeee!!! Last year I honored the day with a party hat and a piece of spice cake, but to be totally honest, I felt like poo! I was solidly into my first trimester morning sickness, and, well, we took a LOT of pictures to get that single semi-decent one. But this year – this year was a true celebration! And would you believe that the cake up there is entirely RAW vegan?! It’s true – I made it myself! No, this year there was no morning sickness. Instead we took our gorgeous little veg baby on a fabulous vegan picnic in the park. It was one of those magical days, Waits was all smiles and the weather was perfect and the conversation flowed so easily. Simpatico. Damian and I had the most amazing talk, the kind that leaves you feeling so fulfilled – challenged and heard and hopeful. Our discussion ranged all over the map, but one central them was, of course, veganism. We spent a lot of time musing on our own, personal understanding of our veg*nism, which is quite different for the two of us. I love this sort of reflection because, at least for me, my relationship with my veg*nism is totally dynamic. It changes, it’s always changing, as I come across new information or reconcile ethical disparities or challenge myself to confront a difficult idea. I am definitely not the same veg*n that I was 2 years ago! ‘Buckwheaties’ gRAW-nola with fresh fruit and coconut water. Orange chocolate cheesecake with coconut snow. Mmm yes I totally ate dessert for brunch. You get to do that when it’s RAW! Over the past few months my diet has gone through another transformation. I’ve been so incredibly inspired surrounding food, in the realms of both flavor and nutrition. I’m completely in love with what’s around me – uncomplicated, fresh, seasonal produce in simple preparations. And simultaneously I’ve been furiously studying health and wellness, applying what I’ve learned in the ancient tradition of ‘food as medicine’. I’m the happiest little witch in my kitchen, concocting the most delicious and nutritious magical creations. And, I feel so good. But veg*nism isn’t just about food – there’s no such thing as a ‘dietary vegan’ (no one stops buying wool to lose weight, or skips the circus for their health). This is a lifestyle, and it impacts every aspect of living. Sometimes I forget how I used to be, all balled up and stressed out, carrying so much anxiety and angst. This weekend I remembered the gift that veg*nism gave to me – permission to relax into a more peaceful existence. Living each day with my actions reflecting my belief in compassion, unconflicted. I’m certainly not perfect and I’m still working on figuring all this out. You’ll notice that I try to refer to my own lifestyle as ‘veg*n’ as opposed to ‘vegan’. It’s just that I’d rather not argue about the minutia, and so I’m more comfortable this way. I have mad respect for those who, for example, will trade in all their old leather as soon as they go vegan. But that’s not where I’m at – and I think that’s okay! It’s a journey, to find our own truth, and then to actually live it. That’s the hard part of course – to be honest with ourselves, and then to live up to that. So, my veg*nism is a beautiful tool for me. A tool that keeps me thinking, and growing, and striving to be the best version of myself. Plus, you know, look what I get to eat! So happy Veganniversary, and here’s to many, many more! Congratulations on your 2nd “veganniversary” and finding (and staying with) something that is so good for you and our beautiful planet. You are inspiring. Recipes for the amazing looking chocolate and lemon cakes, please!! yum. Congratulations! I found your blog after reading your birth story on Offbeat Mama. In fact, I read it while taking a break from working on my application for nursing school in preparation to become a midwife. In the midst of stress from prerequisites and essay writing, you reminded me why I made this decision to begin with. Thank you! I’m really loving your blog. 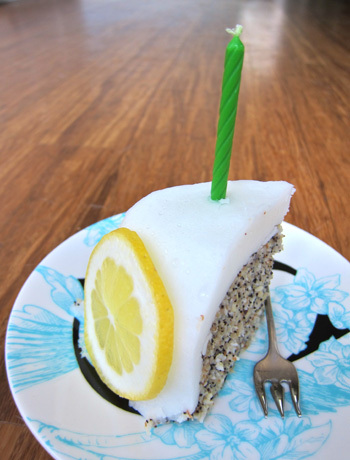 From one vegan to another, Happy Veganniversary! happy veganniversary! i would love to know the recipe for that yummy looking cake! in just the last couple of months i have been adding a lot more raw into my diet. i am intrigued and fascinated and learning all i can. it feels so good to eat this way….i am far from perfect at it but i feel reallly good when i do eat raw. thanks for your inspiring blog! Happy Happy Veg*nniversary!! Your joyfulness and peace comes through in your writing! And, along with these other posters, I would love the cake recipes! Congrats! I celebrated 5 years as a vegan this year. That cake looks UH-MAZING by the way…any chance for a recipe? 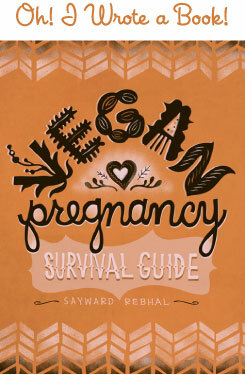 I’m not currently a vegan (mainly due to the fact that while I was pregnant, I actually dreamed so hard about eating meat I would wake up with a drool-soaked pillow! ), but I find your blog so awesome. It’s mostly because you are a lot like me (I’ve been shampoo-free for two years now, and about four years ago I talked my husband into reusable toilet paper and we’ve never looked back!) and I find you very uplifting. Thanks you for your blog, very much. And your son is precious! I can’t believe it’s just 2 years, it seems like you’ve been veg*n for all of your life. You look SO happy! I’m so inspired reading your story dude! Your family is AMAZING, and that cake! MMM! RAW cake? Wow! I’m so happy YOU are so happy and content. I’d also be interested in Damian’s story, you both sound so deliberate and thoughtful! Damian went vegetarian the day after Thanksgiving that year – so about 4 months after I went veg*n. He went veg*n a few months after that. Now he’s 99% vegan. He lives a vegan lifestyle (went way out of his way to find suitable vegan shoes, for example) but he will eat a non-vegan donut if it’s free. Seriously, haha, that’s his main exception! It happens less than once a month. We are both veg*n for the same three reasons – the same reasons anyone is veg*n really: health, environmentalism, and ‘the animals’ – but we prioritize those reasons differently. So while I remain veg*n primarily as a commitment to live without cruelty, and secondly because of the environmental impact, and I just think it’s a totally rad bonus that this is the healthiest way of living, Damian is driven fore-mostly by his dedication to environmentalism, secondly by the health factor, and thinks it’s really awesome that living this way is also best for the animals. yes we will! we love hearing all of it! i wondered for a while why you always spelled it “veg*n” and now we know! AND i’m excited for RAW recipes that aren’t like carrot sticks haha! it’s awesome to see how vastly different everyone is,even with in a relationship (especially in one, sometimes!) andhow ppl can arrive at the same point from ENTIRELY different through processes/backgrounds. ..thanks for sharing! I think I’ll have to make that lemon cake for sure. I love incorporating different foods (vegan, vegetarian) into my world and making them favorites. So, I am just catching up after being out of town, but I just wanted to comment on the doughnut thing… when I was a newish veg*n in high school I totally made an exception for free non-vegan doughnuts too! It was the only thing I made an exception for. I have no good excuse. I worked for the school news paper and we got doughnuts on the day the paper came out each month. But I feel slightly less crazy now, thanks!